One of the more challenging aspects in creating the interactive app for exploring the United States Constitution was the lack of an XML version of the U.S. Constitution. I looked around on the web a bit, but I was unable to find one. (Perhaps I missed it, please let me know). This in contrast to the Titles of the U.S. Code which have been released in .xml Format. Structuring the law as data in XML (or some other structured format) is what permits us to create interesting visualizations like the above, or those here and here. You can download this version of the U.S. Constitution in XML from github or simply copy from below. Please note, this is just a “beta” version. I haven’t fully vetted the contents of the Constitution that I copied, and while I believe it to be correct, there may be errors. Please feel free to copy it and adapt it for your own purposes. Posted in Data Visualization, xml on May 5, 2015 by Harry Surden. I have developed a new experimental interactive app for exploring the United States Constitution. 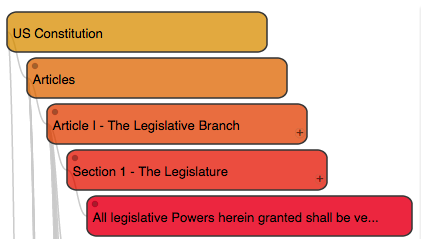 This app allows you to navigate the contents of the U.S. Constitution while displaying the overall hierarchy and structure. You can click on the various Articles and Amendments to expand the sub-parts and and see the accompanying text. Posted in d3, Data Visualization, Visualization, xml on May 5, 2015 by Harry Surden.